This is so super-duper cute!!! I love it ! Hi Wan! 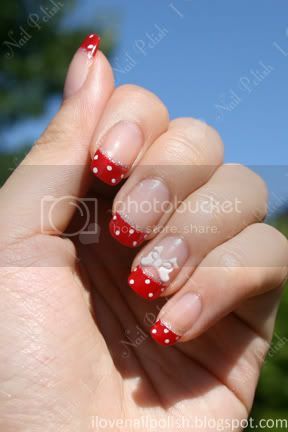 Your Minnie Mouse Manicure is so adorable. You've done a fantastic job!! You have such beautiful nails and this look is so pretty on you. I just love it! Luv your Minnie Mouse Mani! Hey Wan! I love your manicure! I always thought pokadots looked a little bit 'moldy', but I love this on you! Too cute - I'm going to have to give that a try! Hi ! It's a super cute mani, you did a great job ! I wonder if it would be worth looking for rhinestones at places other than beauty supply stores? Perhaps craft stores? I just recently bought myself a dotting tool, it's so much fun! My 13 year old daughter asked for white nails with black dots and it looked super cute! Is the Japanese dollar store Daiso? Daiso is amazing and I've heard it has come somewhere to Canada!! We have one here in Richmond! It's so great you can get everything there!